Randi is a media bug. When public opinion goes in a certain direction for more than a week or two, she goes along. I'm of the opinion that this is better than totally not listening, right? I just have one question. Randi - what's that furry thing in front of you??? Some analysts view such militant rhetoric as a cynical move, designed to rally support for dismantling the testing and accountability frameworks — such as A-F letter grades for public schools — that have been put in place over the past decade by a bipartisan group of education reformers. They argue that unions see tough accountability standards as a threat to members’ jobs and are fanning public outrage to build support for an abrupt change in national policy. When it comes to Common Core, both the NEA and the AFT have long — and avidly — backed the standards, which are designed to guide instruction in math and language arts from kindergarten through 12th grade. Both have taken money from the Bill & Melinda Gates Foundation to promote the standards. The NEA declined to revisit the issue at its convention in Denver earlier this month. But the AFT, which is meeting in Los Angeles, has set aside an hour on Sunday for a no-holds-barred floor debate. That could yield a momentous vote to denounce the standards altogether, said Karen Lewis, president of the Chicago Teachers Union, which is already on record opposing the standards. Even if the union continues to endorse the Common Core, the plan to give teachers grants to rewrite or critique the standards sends a clear message, activists said. The grant program does not need a vote from the membership to take effect. Union officials say they expect to begin distributing grants worth about $20,000 to $30,000 this fall. Local and state affiliates are eligible for the grants; AFT officials are encouraging applicants to build coalitions with parents and civic leaders, though teachers are supposed to lead the work. In an ironic twist, the grant money will come from the AFT’s Innovation Fund, which until recently was supported by the Gates Foundation. Weingarten bowed to members’ anger at Bill Gates earlier this year and stopped accepting his foundation’s money for the Innovation Fund. The fund is now replenished with member dues and grants from the Ford Foundation and Atlantic Philanthropies, AFT officials said. The Council of Chief State School Officers, which helped write the standards, declined to comment on the AFT’s moves to undercut the Common Core. Michael Brickman, national policy director for the Fordham Institute, which backs the standards, said he hoped the AFT leaders would minimize damage to the Common Core movement by tempering their rhetoric. The draft resolution put forward by the executive committee does list some benefits of the standards, which aim to push students to think more analytically and read texts more critically. “If they continue to speak positively for standards, that’s a positive,” Brickman said. The judge’s ruling striking down tenure and other job protections in California was a major blow. The unions will appeal the ruling. But in the meantime, activists are laying plans for copycat lawsuits in other states. A national public relations campaign against tenure is in the works, too — and is being led by a firm founded by two former Obama spokesmen. That development has left many teachers feeling betrayed by their longtime allies in the Democratic Party. 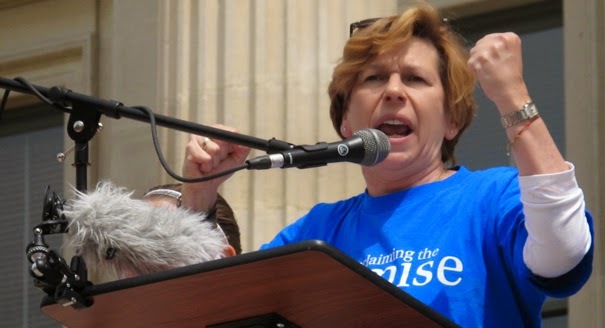 To bolster the union’s coffers for the legal and political battles to come, the AFT leadership is asking members to support a two-stage dues hike that would add $5.40 a year to their bills this year and another $6.60 in 2015. Most of the increase would go toward the “militancy/defense fund” and state and national “solidarity funds,” which support litigation, political activism and lobbying. “Unionized teachers are feeling very vulnerable,” Menefee-Libey said.